Funko Pop! Fighting Droids Gamestop Exclusive In Stock! Gamestop.com has the new Funko Pop! 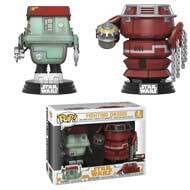 Fighting Droids 2-pack Exclusive in stock and ready to ship! They also have all the other Solo Pop! figures available as well as a pre-order for the Finn/Phasma Rematch on the Supremacy Movie Moments. May Smuggler's Bounty "Solo: A Star Wars Story" Box Contents!